Qxhna Titcomb and Seattle Riot after winning Eugene Summer Solstice. Coverage of the Women’s Club Division is presented by VC Ultimate as part of their season-long support of our women’s coverage. All opinions are those of the authors. Please support the brands that make Ultiworld possible and shop at VC Ultimate! 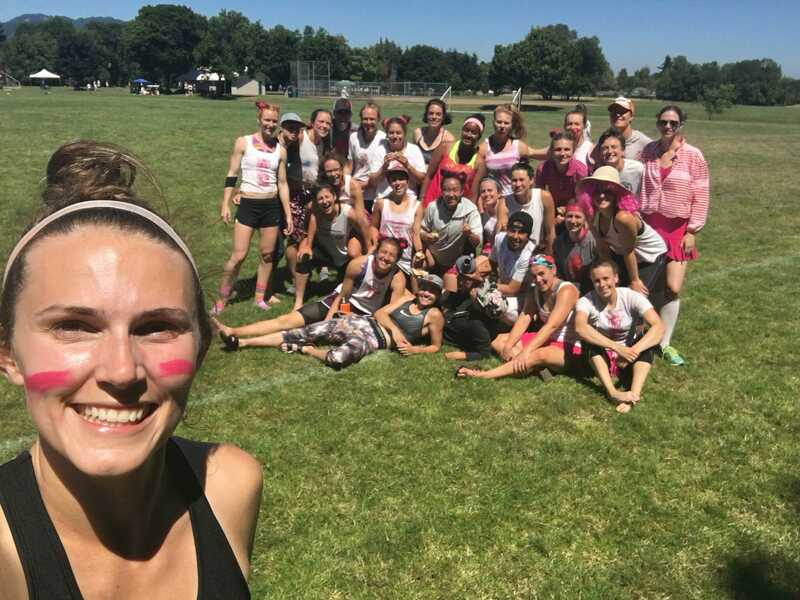 The 40th edition of Summer Solstice brought nineteen women’s teams to Eugene, Oregon, for a tune-up tournament before Worlds and the competitive club season. Five of the teams attending competed at the 2017 National Championships. Oregon Schwa broke on double game point in quarterfinals against Seattle Underground, joining San Francisco Fury, Seattle Riot, and Bay Area Nightlock in semifinals. As expected, Fury and Riot advanced to the final, where Riot avenged a pool play loss to claim the championship with a convincing 15-10 win. The final started off with two possession-saving Riot layout catches1 on their first two points. Riot held, then broke to take a 2-0 lead. After the teams traded three holds making the score 3-2, the wind started picking up, with occasional gusts close to 20 mph. That point included seven Riot turnovers. Carolyn Finney gave Fury multiple upwind break opportunities; she forced three Riot turnovers purely with great defensive body positioning in the endzone and eventually recorded a layout block. The combination of a second Fury layout block, a midfield sky, and a hammer assist gave Fury the crucial upwind break to tie the game 3-3. With the O-line out of steam, Riot was forced to play the ensuing offensive point with D-line players attacking upwind. In what was a huge momentum shifting point, Riot held without a turnover as Charlie Mercer reeled in a huck to make it 4-3. On the next point, a Fury turnover led to Claire Trop receiving the disc ten yards outside the endzone; she threw a pretty OI backhand around assist to give Riot the break and the 5-3 lead. Then: hold, hold, Riot break, hold, hold. Riot led at halftime, 8-5. A fourth Riot break kicked off the second half. The teams traded the next four goals making the score 11-7. Riot wasn’t content to just hold out and took their play to the next level. In each of the following three points, Riot’s D-line forced a turnover and converted the ensuing break chance without giving the disc back to Fury. After ten minutes of dominant defense and three breaks, it was 14-7 Riot. Converting 7 out of 11 break chances is impressive at any level but just downright exceptional in a final against the defending national champion. In Riot’s 13-5 semifinal win over Nightlock, they recorded break runs of two, three, and two goals in another complete defensive performance. Kelly Johnson was nothing short of amazing in the final, tallying one goal, three assists, and three blocks as a defensive player. She often covered Fury’s isolation cutter and effectively moved the disc on the offensive end; it certainly felt like Riot breaks occurred whenever Johnson was on the field. But a humbling defeat in the final will provide Fury areas to improve over the next two weeks before Worlds. They’ll want to limit execution errors against top competition and improve efficiency with their D-line offense. While a 13-5 semifinal drubbing by Riot in semis may seem like a disappointment, the Nightlock captains spoke positively about their weekend. “Our game with Riot was particularly great because it showed us that we have what it takes to play our game against some of the best,” Adrienne Lemberger, Eliza Chang, and Kira Lou told Ultiworld. Nightlock focused on themselves, not the talented teams around them, with goals geared toward “learning and playing [their] system and with each other.” Nightlock finished out the weekend strong, posting a 10-7 win in the third place game against Schwa. After getting blown out by Fury 13-5 on Saturday, Schwa’s O-line scored nine goals in 12 points against the same team on Sunday. Schwa was extremely successful in moving the disc laterally. “The biggest difference between our Saturday and Sunday game with [Fury] was that we were moving the disc quickly. We were throwing to open people and cutting to the open spaces,” said Schwa assistant coach Angela Tocchi. Schwa’s defense generated some turnovers, but they must improve their defensive marks and D-line offense in order to compete with top teams this season. 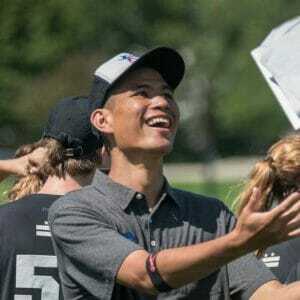 Comments on "Eugene Summer Solstice 2018: Tournament Recap (Women’s)"